Good news for fans of the Nokia Lumia 920 and the Windows Phone 8 OS — launching on the west coast means they won’t have to deal with Hurricane Sandy and the event will proceed as normal. Fans of the Nokia Lumia 920 and other Windows Phone 8 devices such as the HTC Phone 8X and the Samsung ATIV S won’t have to wait that long for the the official launch of the new OS that will be powering these devices. Microsoft will officially launch their much-awaited new mobile OS, Windows Phone 8, later today at 10 AM PST in an event happening in San Francisco, far away from Frankenstorm Hurricane Sandy. As announced by Microsoft of their Windows Phone blog, there are two ways to watch the event live — via the Microsoft News Center or on their Facebook page. Hopefully, after the launch, we’ll now also get more official details on the pricing and availability of the Nokia Lumia 920, the HTC Phone 8X and the Samsung ATIV S.
We’ll be keeping an eye on the Windows Phone 8 launch event and share details with you as soon as they’re available. Stay tuned for more updates later in the day! 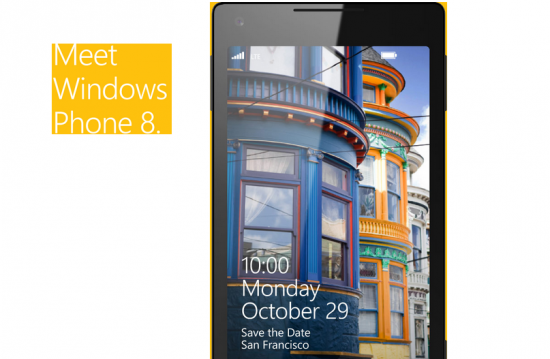 Will you be tuning in to the Windows Phone 8 launch event later today? Have you already pre-ordered a Nokia Lumia 920, HTC Phone 8X or Samsung ATIV S? Let us know in the comments below!